Doctors Flat Vineyard is a single 3-hectare site in Bannockburn in the wine region of Central Otago. The soil is deep gold-bearing gravels laid down by receding glaciers some 480,000 years ago. The Doctors Flat name is taken from an 1890 map of the Bannockburn Mining District that shows the Deep Lead & Doctors Flat Mining Co. held a claim on this site. The vineyard stands at 300m, higher and a bit cooler than most Bannockburn vineyard sites which allows the fruit to ripen slowly and retain its freshness and vivacity. 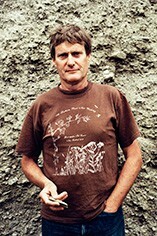 The vineyard is farmed organically, and the winemaker, and founder of the property in 2002, Steve Davies has had extensive experience in wineries in Bordeaux (Ch. Senejac), California (Newton Vineyards and Saintsbury) and N. Zealand (Akarua), interspersed with a series of off-season harvests in Oregon and Burgundy. However he has done enough of the larger company/working for other people stuff and now devotes his time to Doctor’s Flat, a small project which he can manage on his own. The Doctors Flat wine is made in traditional fashion, vinified in small open tanks (1 to 4 tonne), a portion of whole bunch fruit, hand plunge and then left for a week or more on skins post ferment. The wine is is transferred to French oak barrels to mature for a period of 12 months and then racked clean into a small tank for a few more months to amalgamate and settle. The result is well-integrated wine, that's bottled with no fining or filtration in the second spring. It took a long and thorough search to find Doctors Flat Vineyard in 2002, an elevated site on deep, ancient glacial gravels in Bannockburn. The 3-hectare vineyard sits at about 100m above Lake Dunstan. It is cooler than most Bannockburn vineyards, with an increased risk of poor crop levels, but in return the fruit gains in flavour, identity and balance. The three hectares of Pinot Noir were planted with three Dijon clones (114, 115 and 777) on VSP trellis. Steve has developed Doctors Flat Vineyard from the outset, with labour-intensive organic farming in order to maximising fruit quality. The focus now is to build soil health, through organic farming. In the cellar Steve relies on a simple format of small open tanks, close attention, and minimal intervention to produce worthy wine that reflects its place of origin. 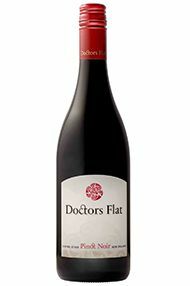 New Zealand’s Doctors Flat is a genuine artisanal wine, produced from a small organic vineyard in Central Otago. It appears that the 2012 vintage was a huge success in the region – an area rapidly developing into one of the world’s finest for the Pinot Noir grape variety. The first release was 2008. Since then, and as the vines have developed, Doctors Flat has begun to develop great character, described as "a slightly spicy, violet, blackberry component” evident in all the releases to date. Production is very limited to around 1800-2000 bottles annually. This wine is developing a cult following over the past few years and has gained praise from the trade and wine critics the world over : “Steve Davies makes one of Central’s loveliest Pinots…” according to Jane Skilton MW. This will be a lovely wine to keep for the next 3+ years and is one of the best expressions of Central Otago Pinot Noir we have come across. "A beautiful mid red, glowing with fruit. Very fine balanced bouquet, a little touch of raspberry with some ripe cherry notes. Very suave yet energetic rather than smooth, this is brilliant! Mouth filling but discreet, ripe by not sweet, this is a coming of age wine for the region."